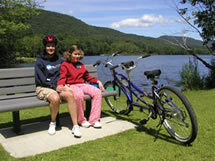 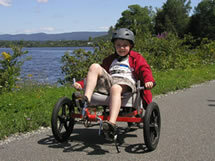 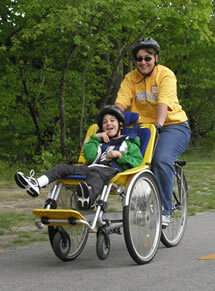 Don't let physical limitations stop you from enjoying a bike ride! 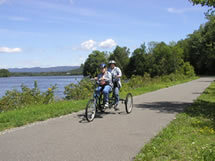 Many well-established bike designs on the market reach beyond the typical concept of the traditional upright two-wheeled bicycle. 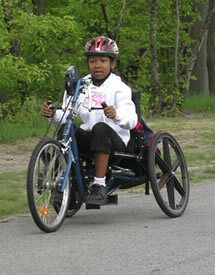 Adaptive bikes often sport three wheels and offer people with a wide variety of disabilities greater stability and function as they access bike paths, trails, and roads. 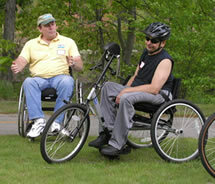 People using wheelchairs with good upper body strength most commonly use hand cycles - hand and arm powered tricycles which come in either upright touring models or sleek, low riding performance bikes. 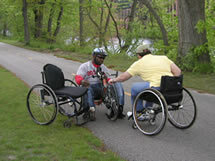 For people who cannot use their legs to propel themselves, these bikes are a wonderful way to get out of a wheelchair and experience the exercise benefits of cycling.